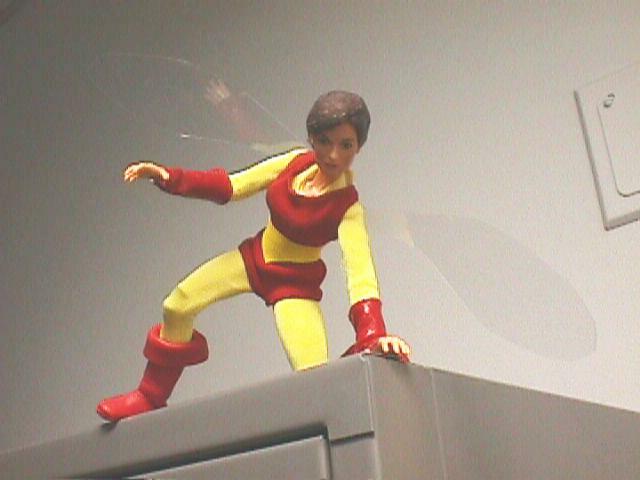 "Just passing through," said Ms. Van Dyne. "No need to worry. No Super-Villains." "Nice to see you!" she called,flying over my head and out of the room. She looked around for a moment. 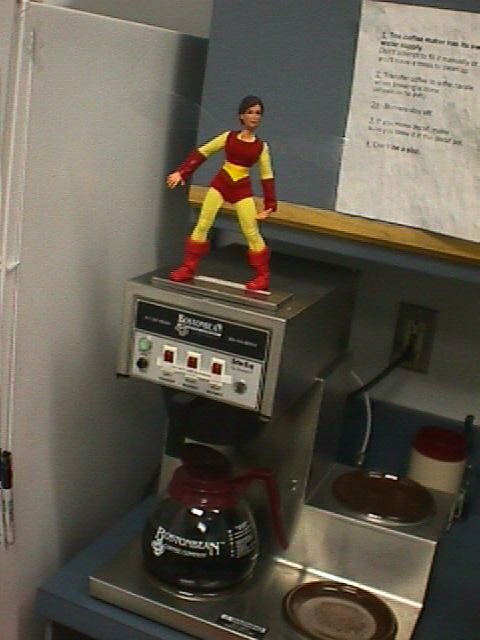 "I'm really just looking for something for Tony Stark," she said. "He thought there might be a Gamma Point Source here, but there isn't. No problem." "One more picture before you go," I asked. Ms. Van Dyne smiled. "Of course!," she said. 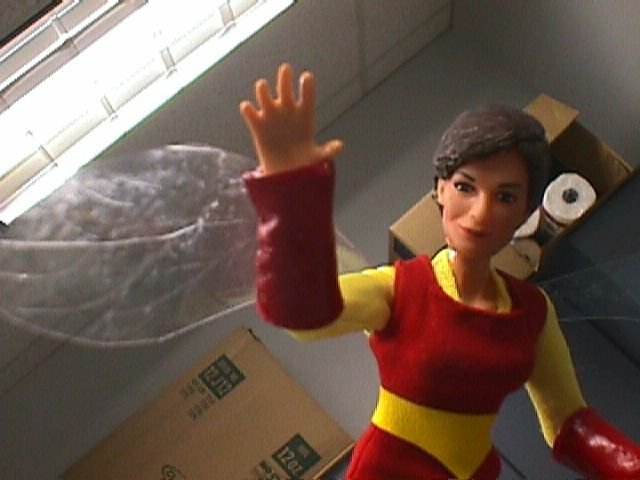 Janet Van Dyne is a Dark Phoenix body with Doctor Doom's feet, and the head of Kate Jackson as Sabrina from "Charlie's Angels" with sculpted hair. 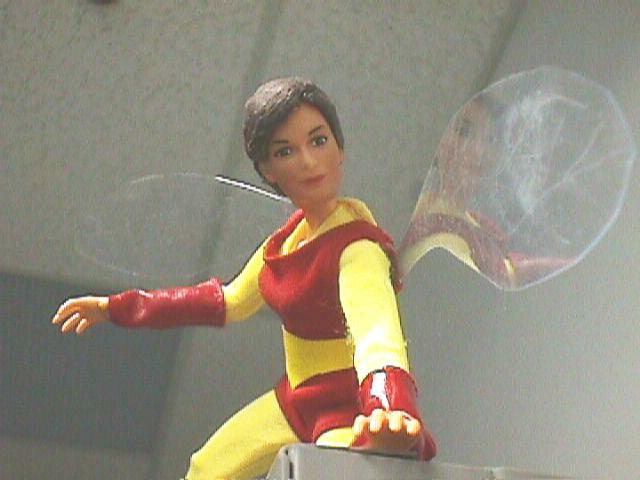 Her wings are cut from the smooth clear-plastic box from a "Moving Soldier Of The World," with little veins etched in with a dental pick. 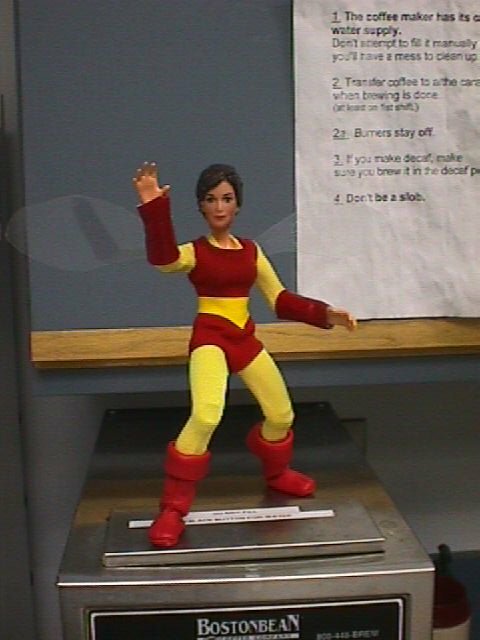 Her costume is the bodysuit from Iron Man, a red Barbie Swimsuit that Time Forgot, Captain America's boots, Gauntlets cut from two of DareDevil's Golf-Club-Cover mitts, and a custom belt made of yellow pleather. The costume here happened pretty much by accident. 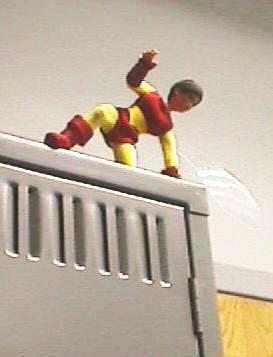 I put the figure in a spare Iron Man jumpsuit expecting it to be baggy, and it fit beautifully, so I left it there. Months later, I stumbled upon the red swimsuit and put it over the jumpsuit, and it looked good, so I decided to go for the full custom. I had a spare pair of Cap's boots, so I tried them on for size, planning to cut off the cuffs, but they just looked so Jaunty, I kept 'em. The gauntlets and belt were natural consequences, and the wings were a nice idea that just worked out. Granting that the costume isn't an exact match for _any_ that Jan wore in the comics, considering the blinding array of costumes she's worn, I feel no compunction about taking liperties with this one... Although I'd still like to try to make the white one with one sleeve and one legging.